Who says disco is dead? A huge dinner party planned for later this month will offer guests the chance to indulge in an extravagant feast, wild cocktails and plenty of disco decadence. On January 30, Disco Dining Club, an elaborate bi-monthly disco-themed dinner, will celebrate their first anniversary with a wild party, featuring food (including an oyster bar), craft cocktails, DJs and plenty of dancing. While past dinners have been themed around a certain aspect or genre of disco (bathhouse, cosmic, or italo, for the disco savvy), this time around the theme is pretty straightforward: "consume. everything." The party will take place at a secret location—to be revealed to guests on the day. 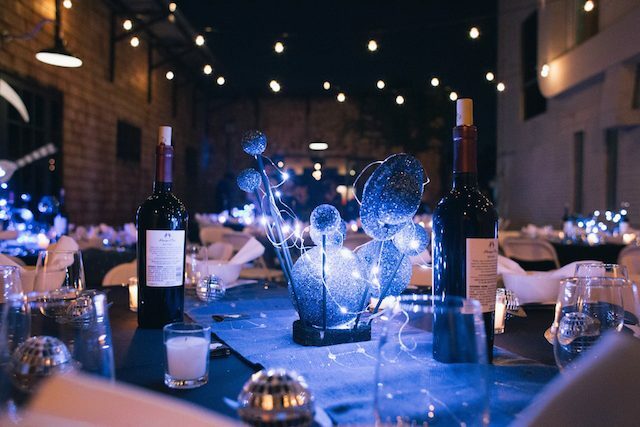 Upon arrival at the secret location—which will be decked out with intricate set designs—guests will be treated to a cocktail from the open bar and unlimited oysters courtesy of Shucks Oysters LA. Guests will also feast on delicious bites provided by the chefs from Re Creo Supper Club. Music throughout the night will be provided by Berlin-based Eddie C, Sleazy McQueen, and L.A.-based DJs Alison Swing and TK Disko. There will also be special performances throughout the night, which in the past have included burlesque dancers, musicians, drag queens and more. This is not your grandmother&apos;s dinner party. "Disco Dining Club is a party I want to attend—a completely debaucherous experience that is fully drenched in frivolity," founder Courtney Nichols tells LAist. "Why spend an evening dancing, or eating, or drinking, when you can spend an evening doing all three? Disco Dining Club is a chance for people to be the most ostentatious versions of themselves, and the crowd fully embraces this freedom. Nothing and no one is too bold for Disco Dining Club. I ask but one thing of our guests: to consume everything." Nichols, who has an extensive background in nightlife events, collaborates with Erick Varillas for the creative direction of the dinners. While many of the previous dinner parties have taken place around L.A., they&apos;ve also thrown them in other cities, including Berlin. The first anniversary of Disco Dining Club takes place on Saturday, January 30, and tickets for the night are $100 per person. For tickets and more information, email them at member@discodiningclub.com. Extravagant disco-inspired attire is strongly encouraged.